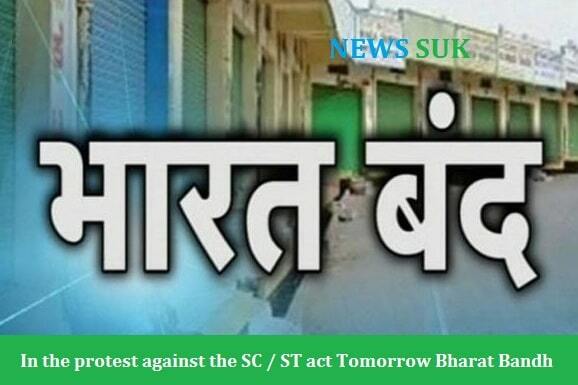 The protests of upper castes have caught the attention of the SC-ST Act. In view of the proposed shutdown on September 6 in Madhya Pradesh, the government has instructed to take caution. Police are on alert about the ongoing protest in the entire state and after the Shivpuri, the district magistrates of Morena, Bhind, Sheopur and Chhatarpur have imposed Section 144. In the monsoon session against the order of the Supreme Court, the Central Government passed the proposal for amendment in the SC / ST Act. There is a lot of anger in the upper castes, before the elections in Madhya Pradesh, all the political parties have to face the opposition on this issue. Nearly 30 to 35 organizations, including Sapaks, have announced the closure of India which is being seen only on social media. But in view of the way in which the cases of violence were made after the closure of Scheduled Castes in April against the Supreme Court’s decision, the Central Government has issued instructions to make stringent arrangements for security. Security agencies have also expressed their apprehension about the alleged closure on Sept. 6.IG Intelligence Makrand Deoskar has issued a statement regarding this and said that on September 6, the bandh called through social media has been done by different organizations The police superintendents of the state have been instructed to take vigilance. According to the information, in the three districts of Madhya Pradesh, Morena, Bhind and Shivpuri, preceding precautionary measures have already been issued on Tuesday, Section 144 has been completed which will be effective till September 7. At the same time, the state police officials have been told that they meet with the heads of the organizations to try to win the trust and try to win the trust. At the same time, those who write provocative messages on social media will be subjected to strict action. In response to the same SC / ST Act, organizations have warned against showing black flags by encircling public representatives. Due to this announcement, MPs, ministers and MLAs in Gwalior-Chambal have canceled all the programs for the next day. Dharmendra Sharma, national president of Brahma Samagam Swarna Janakalyan Sanghat said that more than 150 organizations affiliated to the upper castes and OBCs will participate in the bandh. They are raising the full benefit of the forthcoming elections and have declared it to oppose voting right now. There are placards in front of the shops in the Cenvada protesting that political parties should not be embarrassed by seeking votes, we are upper caste. The same thing is also in Shivpuri where on Tuesday evening, Sapaks issued a prescription that ‘We oppose reservation and SC-ST Act, please do not embarrass us by asking for political parties vote’. Significantly, there has been protests against the SC-ST Act since last one week in Madhya Pradesh. Several leaders and ministers including CM Shivraj Singh Chauhan, PCC chief Kamal Nath, Congress MP Jyotiraditya Scindia and black flag are shown by the agitators. On Tuesday, there was a meeting of senior BJP leaders in Delhi under the chairmanship of Amit Shah to discuss the situation.